The professional development programming from the School of Science is tailored for students in science, mathematics and the technical professions to help prepare each of them for the next step in his/her career, be that a job, an internship or further study in graduate or professional school. Events co-sponsored by the Pre-Health Advising (PHA) are indicated with that abbreviation. All events are announced on Facebook and via circulars available from the Deans’ Office. Students should also be aware of a comprehensive slate of events offered by Career Services. Personal Statements for Graduate School Workshop: Wednesday, September 28. 2:45 – 4:15 p.m. Personal Statements for Professional School: Wednesday, April 12, 2:45 – 4:15 pm with Associate Dean Catherine Duckett. Wednesday, September 17 “How I Spent My Summer Vacation: a summer internship panel and mixer” Internship Panel, Magill Commons, Club Dining Room, 6 – 8 p.m.
Wednesday, September 24 – “Innovation in Life Science Product Development” Biosciences – Donna J. Edmonds, CEO and President, Virginia Biosciences Commercialization Center and Karin Fredricksen, Magill Commons, Club 107-109, 2:30 p.m.
Wednesday, October 8, “How to succeed in college and still have fun! : a panel of success stories!” Magill Commons, Club Dining Room, 6 – 8 p.m.
Wednesday, November 5, Find an Internship Panel: CSSE/IT/Biology/Chemistry Internships, Club Dining Room, 6:00 – 9:00 p.m.
Monday, November 10, Is Graduate School Right For You?, Wilson Hall, Room 104, 5 – 8:30 p.m.
Wednesday, November 12, Tell your story, find your dream job: Personal Branding Using LinkedIn. (Organized by Career Services) Wilson Hall. 2:30 – 4:30 p.m.
Thursday, November 13, Personal Statements for Graduate School, Edison 148A, 4 p.m.
Monday, November 17, “Alumni Focus: On the Path from Monmouth to Medical School”, Dr. Mike Pollaro, Club Dining Room, 3:45 – 4:45 p.m.
Tuesday, November 25, “Life of a Veterinary Student in the Third Year”, Nicole Starinsky, Edison 148A, 12 p.m.
Tuesday, February 10, Career Choices Roundtable, Magill Commons Club Rooms, Keynote Speaker Alumna Patty Azzarello ’86. 5:30 – 9 p.m.
Wednesday, February 25, Rocking the Resume: Crafting Effective Resumes, Amanda Marciniak of Matlin Silver, Edison 156, 3:45 – 4:30 p.m.
Wednesday, March 25,$tart $mart:, a salary negotiation workshop, Magill Commons, Club Dining Room, 6 – 9 p.m.
Wednesday, April 29, Resumes and Recruiters, Resume workshop, Edison 156, 2:30 p.m.
Thursday, May 7, Personal Statements for Medical School Workshop, Edison 148A, 1 p.m.
Wednesday, Sept. 18. 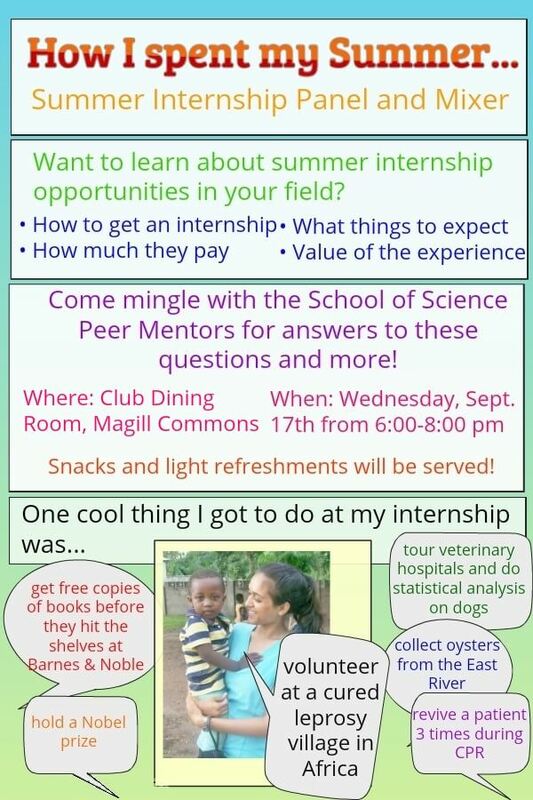 Summer Internships- From Chocolate to the North Pacific: Four student perspectives, Wilson 104, 7:30 – 8:30 p.m. Light refreshments provided. Monday, October 14, Effective Resume Writing for Scientific Fields with Michael Baldini, Carol Afflito Room, 3rd floor Student Center, 6 p.m. Light refreshments provided. Thursday, Oct 17, 2013, “Personal Statements for Graduate and Medical Schools,” Associate Dean Catherine Duckett, afternoon, by reservation only. See our “Personal Statements” page for further information. Monday, October 21, Are you ready for Graduate School? A panel discussion, Young Auditorium, Bey Hall, 5:30 p.m. (Co-sponsored by the Chemistry Club). Light Refreshments provided. Tuesday, October 29, Assessing your Academic Success Plan, Club 109, 7:30 p.m.
Wednesday, November 20 (rescheduled from Nov. 12), Internships in Chemistry and Biology Panel Co-Sponsored with Chemistry Club, Club 109, 6 p.m.
Tuesday, February 4, 2014 – Career Choices Roundtable – 5 – 9 p.m., The Club, Magill Commons. Tuesday, March 25, 2014, “Personal Statements for Graduate and Medical Schools,” Associate Dean Catherine Duckett, 3:45 p.m., Bey Hall 201 (Turrell Boardroom). Bring your draft statement. See our “Personal Statements” page for further information. Industry Internship Event, Wednesday, April 2, 2014. Club 107-109, 6 – 8 p.m., A panel discussion with local firms, including Forefront, Inc., DefinedLogic, Sparta Systems, and Vital Voice and Data, offering internships to science, CSSE and mathematics students in summer and fall semesters. Refreshments will be provided.